We deployed 10 teachers in following Village Learning Center at Madurai, Tamil Nadu. Last year we had five centers & this academic year (2009-10) we increased to 10 centers. Our Sincear thanks to our Partner TCE-CRESCENDO eGroup (P04), Who is paying salary for 5 Learning centers. Our Sincear thanks to our parnter Helping Hands (India Sudar Member Code 612), Who is paying salary for 5 Learning centers. Visited Thiyagam Narpanbu kalvi maiyam. On 9th Mar, we(myself & RajaSoundar) visited Thiyagam Narpanbu Kalvi Maiyam(TNKM) @ Madurai. We had a good chat with the chief trustee Amudha Shanthi & her brother Selva. They are very much enthusiastic abt the development of the village students nearby Madurai. Currently we are supporting 5 villages’ teachers’ salary. Earlier they were working on “village pattern”. Now, they r in “individual pattern”… Meaning, they analyze the impact of the Narpanbu kalvi maiyam on every induvidual in that village and they showed us every student’s report and it was really happy moment for us to know that the change is happenning. 1. Report of Thiyagam Narpanbu Kalvi Maiyam(TNKM) – evening free tuition centre report from April to Sep.07 along with impact of the children. a. A boy with folding handing telling a moral story – Childrens Day program at Thiruvedagam village. Five free evening tuition centres have been started in villages Thiruvedagam, Kamatchipuram, Melakkal, Pudur, Keelamathur in Madurai Dist. Due importance is given to Value inculcation through various methods inspired by V-Set and Mr Ravichandar from V-Set, Chennai visited Madurai and given special training to TNKM teachers on the implementation of life skills program. Refresher camp conducted on 06-05-07 for all the 165 children at Nagatheertham imparting training on handicrafts, street play, oyilattam, Bommalattam, awareness songs, painting, moral stories etc. Children participated with great enthusiasm. Nandini Voice for the deprived has donated Note books for the children of TNKM centres and the same was distributed. Parents Meet was organized at Thiruvedagam on 15-07-07 with 15 parents and shared the views of Parents participation in TNKM efforts. 15-08-07 – Independence Day was celebrated and the talents of children encouraged. Trees were planted by Chief Guests on the occasion. 23-09-07 – Thiruvedagam Vivekananda College has conducted yoga and breathing training for the students of 8, 9,10th std was conducted. College Principal Sri Vannirajan given his full support for the program. Life Skills Program have been taught following the precepts from Thirukkural and also learning from V-Set. Special Talent Improvement program initiated which consists of Ooyilattam, singing, dancing, story telling, drawing, essay writing and oratory. Mini library is being set up in all five villages to improve the reading habit. Pichumani, a student unable to walk properly. Now through the inspiration and guidance of the Centre he walks and studies well. Easwari went to Chennai and visited beach. She saw a girl was about to sink in the waves. She informed the same to her parents and rescued the girl. Naveena was going in her by-cycle. She helped a girl who was standing for a long time waiting for the bus by giving her doubles. Poornima, a girl student coming from a deprived family. Understanding family situation she sells flower garlands and support the family during her spare times. Nandini went to Thirthakarai temple. She felt that it would be helpful to public if the hill was cleaned. With the help of some students she cleaned the hill temple and increased the beauty of the place. Divya has written a wonderful essay on ‘Our village in 2010’. Village water tank was cleaned by our students during holidays which was appreciated by all. Students convey the message from Thirukkural and apply the same in their life. The school teacher said the children moves very well and has good manners. Practicing yoga and breathing with other students. 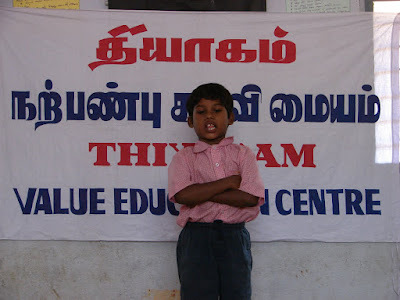 BTW, we (Myself – 91 and Senthil kumar – 144) visited Thiagam women’s trust, Madurai. The trust is run by AmuthaShanthi, who is physically challenged. First she started a weaving m/c training for physically challenged women. Then, now she expanded the centre for poor women also, in and around madurai. Actually, now the centre is run by her sister, who has dedicated her life for this centre. They export the small items which are manufactured in the centre. Below is the details of TNKM, if u wanna know more.